A quick call to Stefanie Glassman at dahm international confirms that Jochen Brill has now take over the central agency for sale of the 35.05m sailing yacht Galatea. Built by Heli Yachts in 1998 to Bureau Veritas class, she's recently had an extensive refit and can accommodate up to seven guests in a master suite, two twin staterooms and a single cabin. In the last three years, Galatea has cruised 20,000 nautical miles and has proved to be a very steady and safe sailing yacht. She heels moderately in all winds and reaches up to 15 knots. 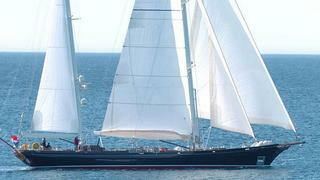 Lying in Palma, Galatea is asking €2.75 million.